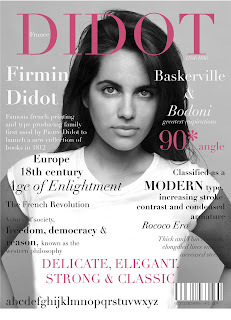 This magazine cover was created to show the design aspect of the "Didot" modern typeface. The The layout is intended to look contemporary and to follow the Bauhaus style. The inspiration behind this style comes from the Swiss grid, aesthetically clean, simple, white space and orderly. Color was just a touch of elegance and balance while using black, whites and grays emphasizes the hierarchy of words. The forward taken picture connotes the meaning of simplicity. LOGO REMAKE with a twist.